Shantock Bears: Such a lovely but busy few weeks! Such a lovely but busy few weeks! I can't stop smiling! 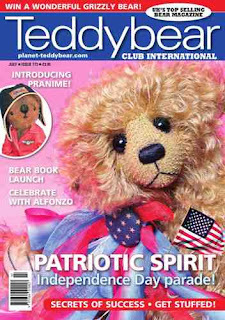 Yesterday I got my online copy of July's Teddy Bear Club International with my bear on the front cover! Remember that "big" bear I made a while back well that's what he was made for and I'm delighted. Its been a dream of mine to have a bear on the front cover of a magazine since I first started making bears and thanks to the lovely Kirste at TBCI my dreams have come true! There's also a 4 page article on me and the bears on page 14, I really couldn't want for more. If you would like a copy pop into WHSmiths or visit http://www.teddybeartimes.com/ where you can buy a copy when it is available. I've feel like I've got nothing done this week, I had to work as usual Monday, Tuesday and Wednesday and because I've been so tierd have done no bear making in the evenings (I usually work for a few hours every night!) I think its good to have a few days off then come back all fired up with new ideas! I also had a job interview yesterday, if I get the job I'll be working for Amersham and Wycombe college in the Health and Social Care department as a NVQ assessor. I qualified last year and have been waiting for the perfect hours to come available somewhere so I don't have to leave my other job, fingers crossed that I'll hear something early next week! Congrats Elanor! I bought the magazine on friday and had a good read. What an achievement and completely deserved!